SNAFU! 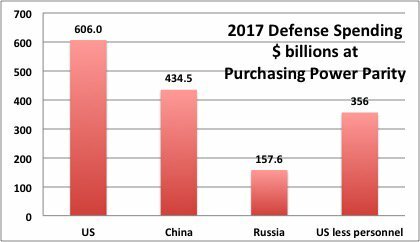 : Apples to apples comparison shows China spends more on defense than US? Apples to apples comparison shows China spends more on defense than US? This is rather obvious and has been talked about for years. It's good to hear senior military leaders actually voice it in public. What I'm still waiting for is a bit of reality. Russia is showing a defensive posture in their military spending. China? China is obviously aggressive and yet we still see our forces oriented toward a defensive Russia instead of the real Dragon in the corner waiting to gobble us up.